Upwaltham barns is a gorgeous family run wedding venue set in the stunning South downs, between Chichester and Petworth. It is an incredibly popular wedding venue and it’s easy to see why. With its gorgeous rustic but contemporary barns, idyllic countryside setting and a team of talented individuals, who have each couples best interest at heart. With great enthusiasm and a love for the job they do, they look after each couple’s individual dreams and wishes for their big day so amazingly well. So, I was absolutely honoured to be asked along to capture Upwaltham barns and their in house caterers ~ Nibbles 2 Nosh most recent wedding experience evening. The idea of inviting couples, who have booked their dream wedding at the venue to come along for an evening, to fully immerse themselves and experience a night of fine dining and great hospitality, is just such a wonderful idea. 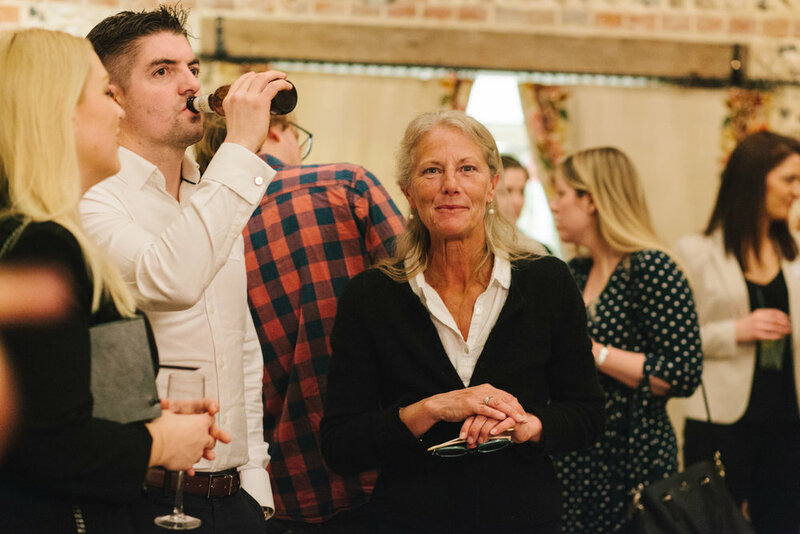 Getting the chance to catch up with their individual wedding planners, sample incredible food from Nibbles 2 Nosh, and meet and chat to other lucky couples getting wed at the barns. Alongside all this there is also the chance to meet a hand picked selection of local suppliers, who help transform the barns and create a real wedding evening look and feel. With Jane from Forge flowers, creating exquisite floral table centre pieces and Invited with Love creating a number or different beautiful designs of place names and table names. Hire you day had dressed the main South barn beautifully and Quirky chair covers had a few of their beautiful handmade chair covers on show. The gorgeous Chloe Rose was also wandering around, capturing a visual video story of the evening. To entertain the guests throughout the evening was the uber talented Amy Baker, singing a collections of classic jazz and swing songs with her soothing dulcet tones. Absolute perfection! I had such a wonderful evening, capturing candid shots of the couples and the Upwaltham Barns team at work. I absolutely loved getting behind the scenes in the kitchen capturing chefs, Claire, Simon and Lou in action creating hundreds of Canape and amazing dishes. An unbelievably talented and down right lovely bunch of people! It was so great to watch the great rapport that the team at Upwaltham and Nibbles 2 Nosh have, it really does feel like one big happy family. I truly believe that this goes a long way to the wonderful experience and success they have had in creating one of the most special wedding venues in the South East.